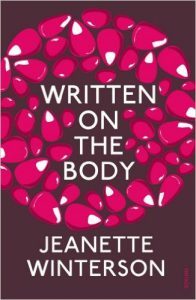 If you have read any Jeanette Winterson before then Written on the Body feels like familiar territory. There is a protagonist of uncertain gender who has male and female lovers. There is a true love with flame red hair. There is also a passion for the minutiae of falling in love, an obsession with the different ways of expressing desire. What starts as a love affair in which the narrator claims not to want to possess the other but to be possessed – ‘Louise, your nakedness was too complete for me, who had not learned the extent of your fingers. How could I cover this land? Did Columbus feel like this on sighting the Americas? I had no dreams to possess you but I wanted you to possess me.’ (p52) – using, regardless, the language of colonisation and hunger, becomes a different contemplation of her lover’s body when Louise develops Leukaemia. Louise’s body starts to become foreign to itself and the narrator is forced to make a choice about how to help Louise fight her illness: should she stay with Louise or give her up to Louise’s husband, a cancer specialist who believes he can cure her. I’ve given away a lot of the plot, but in a way this book isn’t really about plot. Reading the last two paragraphs of the novel tells you that. Forcing a rush of plot into the ending reads like something the marketing department insisted upon in order to keep the general reader happy (you’ll see) and even then it remains ambiguous. Instead, Written on the Body is a kind of prayer to love, a measuring of all the parts of the narrator’s lover, an answer to the opening question, ‘Why is the measure of love loss?’ (p9). The quotations on the back of the book proclaim Written on the Body to be a ‘philosophical meditation’, a ‘sensual plunge’ and it is those things, but it is also frustrating; the intensity of the storyline, the fixation on the love story aside from its daily trappings is both beautiful and saccharine. 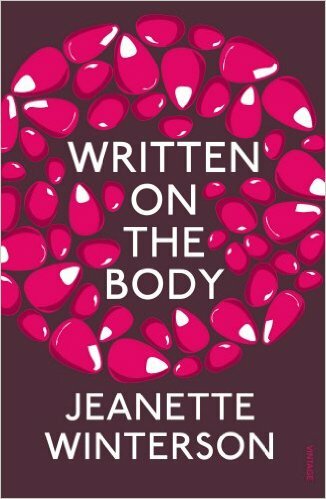 I enjoyed reading Written on the Body, I admired some of the writing, but I didn’t feel moved by it. It sparked interesting thoughts but given the wider suggestive possibilities of studying the micro the novel didn’t quite deliver for me. For me, love and the body have their less palatable sides, sides that Written on the Body doesn’t really explore. It made me want to recommend Zeruya Shalev’s Love Life all over again. Written on the Body is like a beautiful love letter, personal in a way that doesn’t allow for wider interpretation; Love Life takes the sensual plunge into a more brazen, blazing field. Next week I’m reading Marie Ndiaye’s Ladivine.